Hey friends! 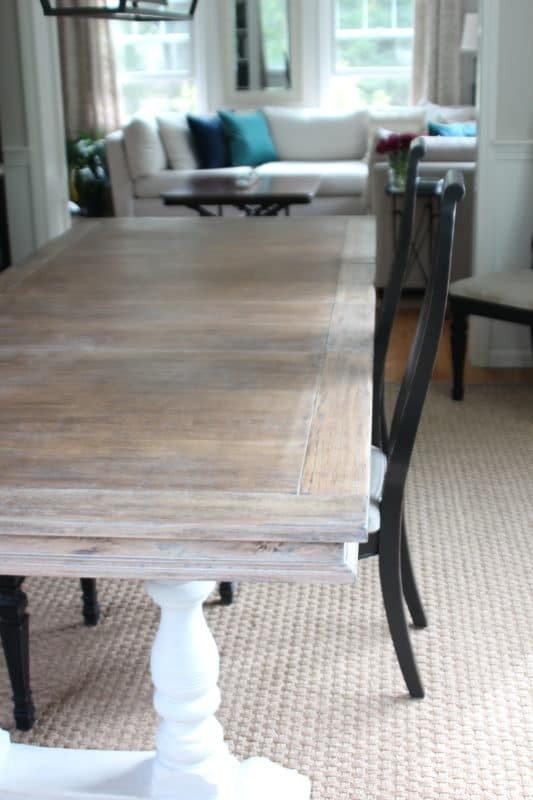 At long last I’m sharing our dark walnut-stained table that went light and limed! 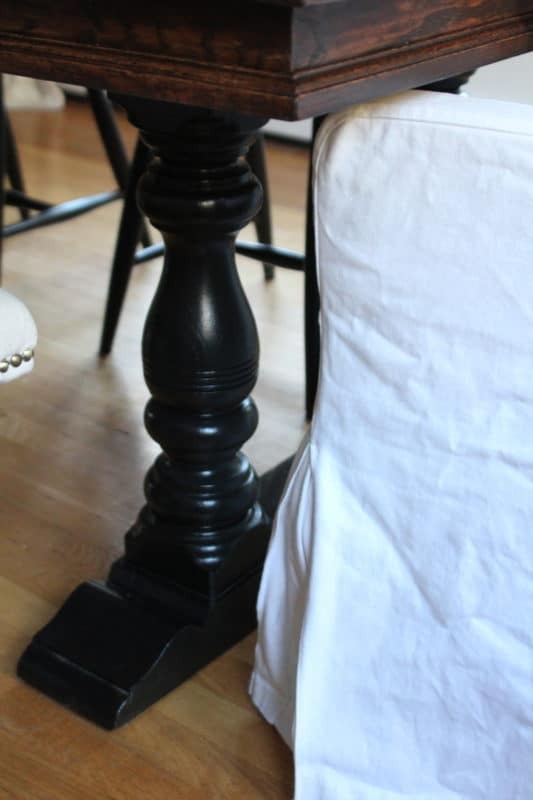 Yep that’s right….the oak top Craigslist table I dragged my husband on a roadtrip with me for…..
and painstakingly refinished less than three years ago…..
…..has been stripped and refinished again! Because I’ve completely lost my marbles! But I’m so happy I did it!!! 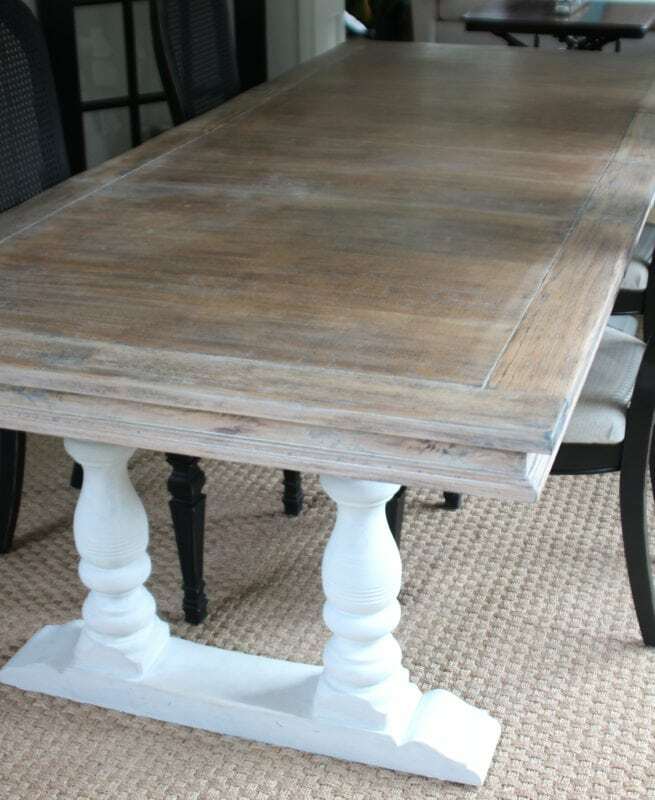 In the first round, I spent weeks stripping and sanding the table all the way down, and then Mark and I mulled over whether to go light or dark. 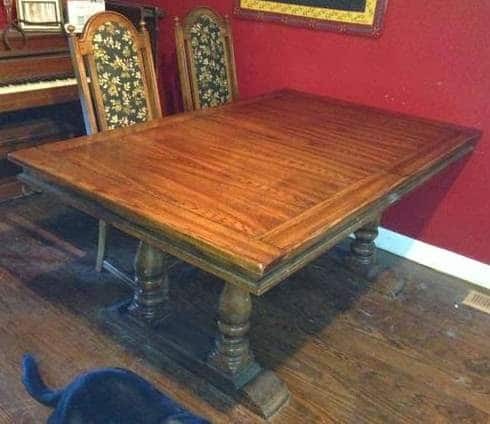 I ended up staining the top a dark walnut to give some contrast to the dining room. When I stripped the base it turned out to be a different species of wood that I couldn’t identify. It didn’t take the stain really well, so I painted it black. 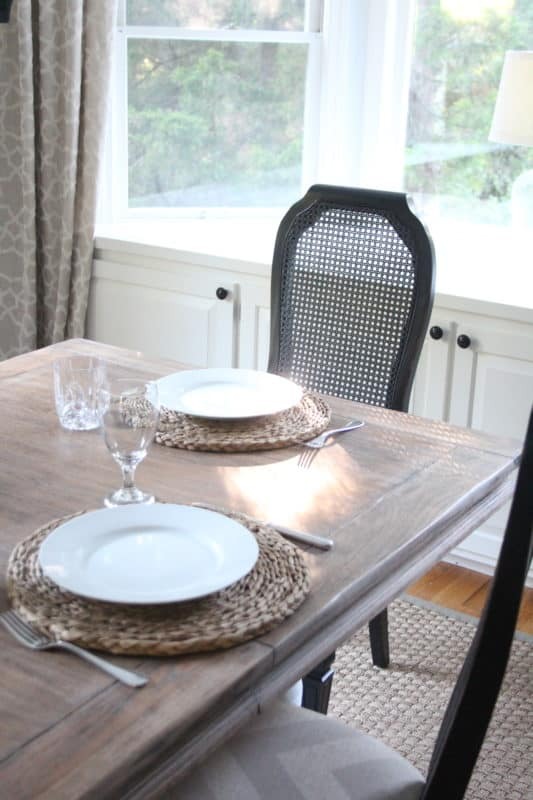 We really liked the end result, and have loved having a big table and tons of space for everyone, but it did have a more formal feel than we were after and every once in a while one of us would remark on more rustic, casual farmhouse tables. Fast forward to this July. 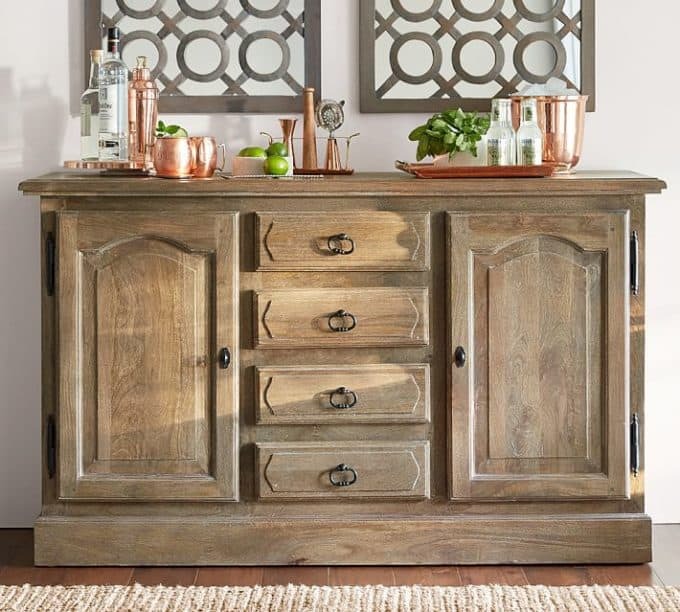 I’m chatting with Mark while flipping through the Pottery Barn catalog as we’re standing at the kitchen counter one Saturday, come across the Linden buffet and table – we both oooh and aaah at the wood tone, and lament once again that we went dark with our table. 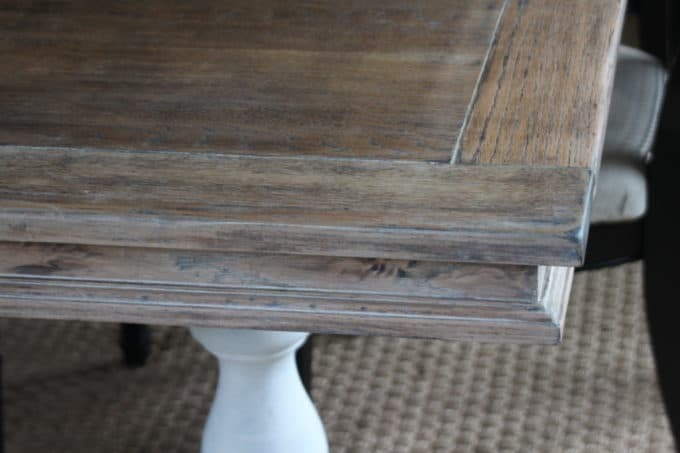 The PB pieces are so pretty, but we both also love old wood that tells a story, and our table is old. 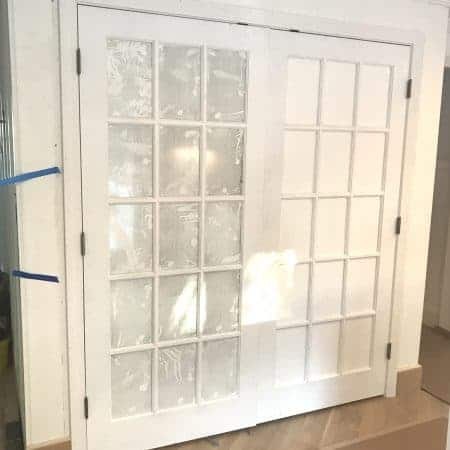 The original owner bought it when he was an American soldier stationed in Germany, brought it home to New Hampshire with him and eventually passed it on to his son. Now it is the epicenter of a busy family who love to gather, cook, eat, entertain, linger around the table and not fuss over anything too precious. 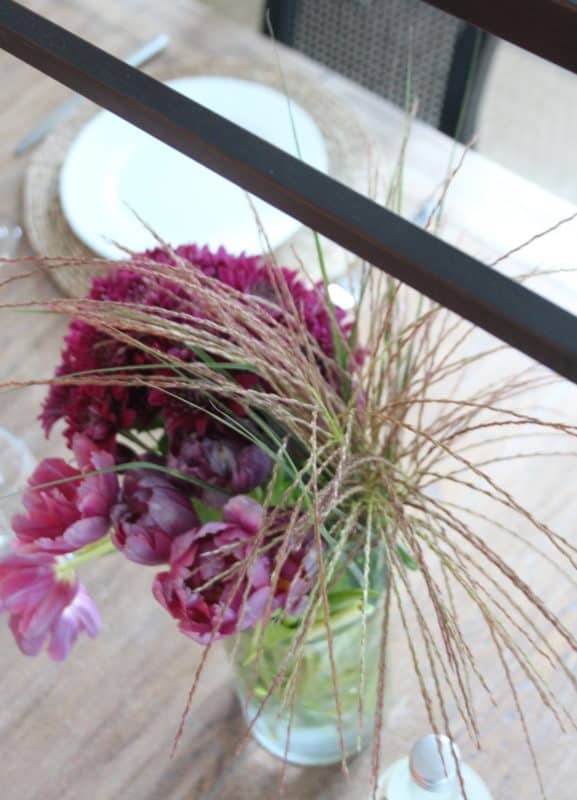 We loved the idea of not only lightening up the table but also giving it a more casual, worn look and feel with a patina that we will add to through the years with our kids, family and friends. AND SO……I ended up stripping the entire top and apron again, in the midst of ten other projects and all sorts of plates spinning in the air. No time like the present! This time instead of sanding it all the way down, I left some of the walnut stain in the nooks and crannies, stained over the whole thing with Minwax Weathered Oak, and then added both Amy Howard’s Liming Wax and Light Antique Wax (a warm light wood tone). I didn’t go for perfect or brand new, and it suits us so much more now. 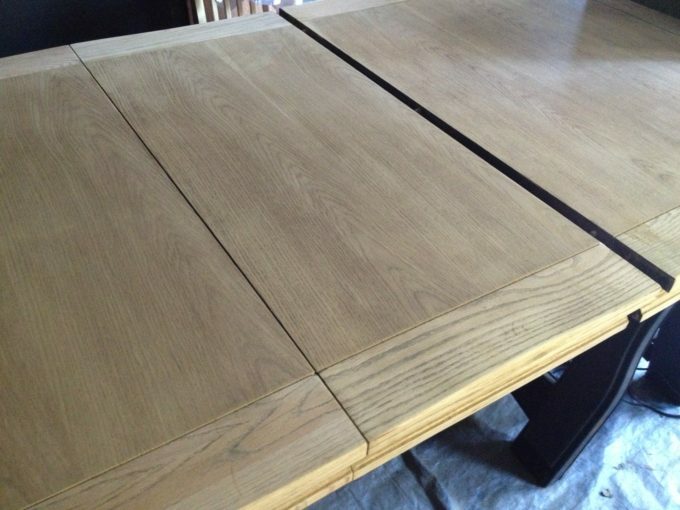 Is it perfect like the PB Linden finish? Nope it sure as heck isn’t. 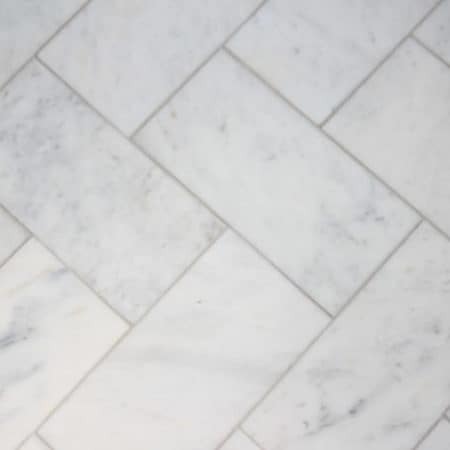 It’s a seriously IMperfect restaining job this time around, but the funny thing is we love it so much more like this. It feels comfy and homey and softer somehow. I’m not much of a worrier over furniture in our house getting scratched or chipped or abused anyway, because that’s life and I have no desire to have things in our home that are too precious to use. I painted the base white and that was a game changer too. This photo below has nothing to do with anything besides the fact that it all makes me happy: Trader Joe’s flowers just plunked in some water with seagrass picked from the yard, making dinner and taking pictures and tidying up and admiring the new light that just got hung this week while I wait for everyone to burst through the door and the evening chaos to commence. It’s going to go from quiet and serene to loud and messy and backpacks and homework and food and drink in about 5 minutes and that is exactly how I love it. I’ll give you the 411 on how I refinished this limed-oak-table-with-serious-patina next week, there was some trial and error involved but all’s well that ends well! Thank you so much Josie! It was fine before but now I really love it! You did a beautiful job, Lisa! Ironically, I have been thinking about restaining my kitchen table in a darker tone to go better with the island. I have been searching for the right table for the space and one day it hit me that I should just stain this one. Maybe your post is giving me a sign to do it! Anyway, I love how yours turned out – both times! Enjoy your weekend! 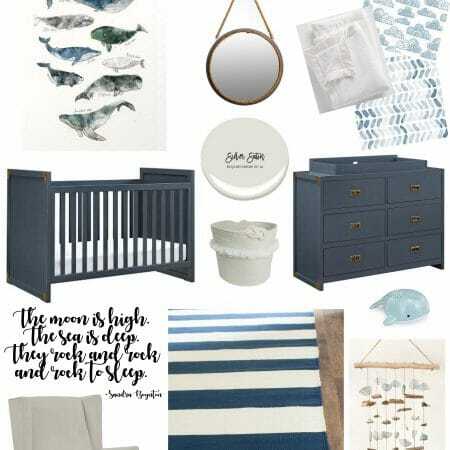 Shelley that’s a great idea – a little darker would look amazing with your gorgeous island! 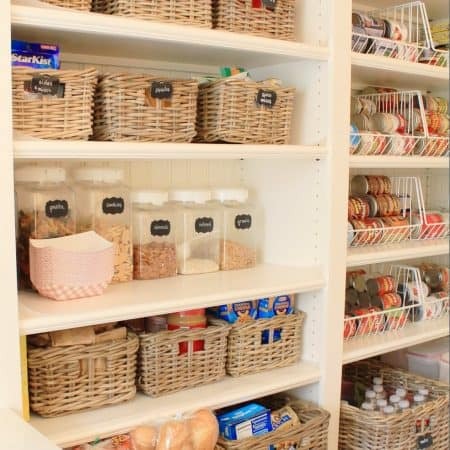 I did this makeover on a whim but if I had done any planning I would have taken it apart and out to our garage. I love Citristrip gel stripper but it makes such a mess in the house. Good luck with your table if you go that route! Can’t wait to see! lisa, it’s beautiful! that finish was meant for it! Thank you so much Denise! I loved the dark stain but I felt like our house was out of balance with so many dark wood and black pieces. 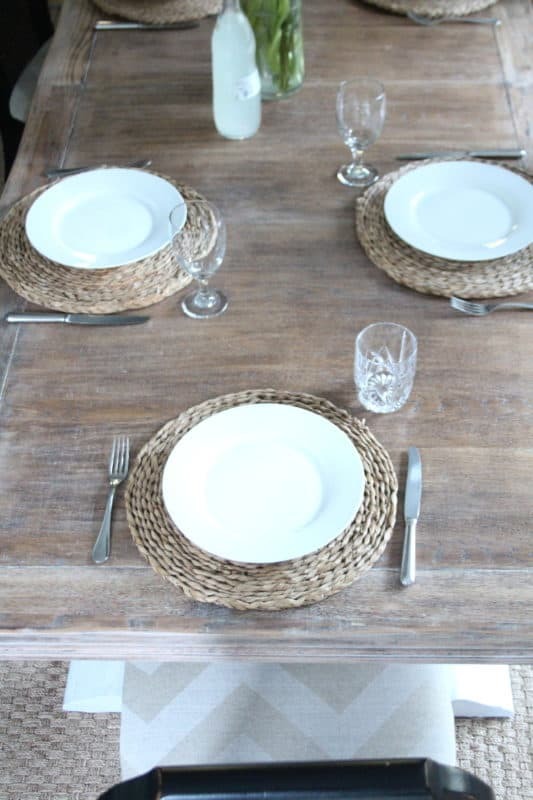 The lighter table seems to balance it all out a little more, and the low maintenance finish is perfect for us! Lisa…once again you are amazing.. I can’t imagine when you possibly were able to fit this into your schedule! Thanks Bets! 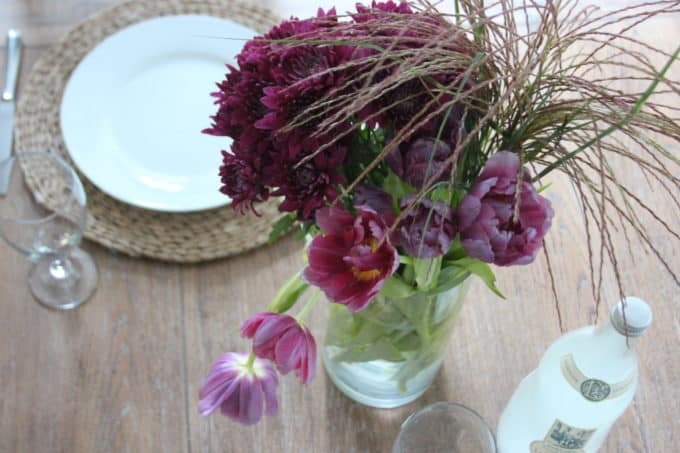 This makeover was born out of the crazy summer-hanging on by a thread-so let’s makeover the table in the middle of it all 🙂 I hope to have you and the rest of my framily sitting there soon!!!!!! Holy smokes, it’s gorgeous!!!! I think liming wax is just one of the coolest things ever. It completely lightened up the whole area and looks amazing! Thank you my sweet friend!!! It does seem to balance out all the dark pieces in our house a little better! WOW, what a fabulous transformation,Lisa!!! Your vision was spot on, it doesn’t even look like the same table as the CL pic! 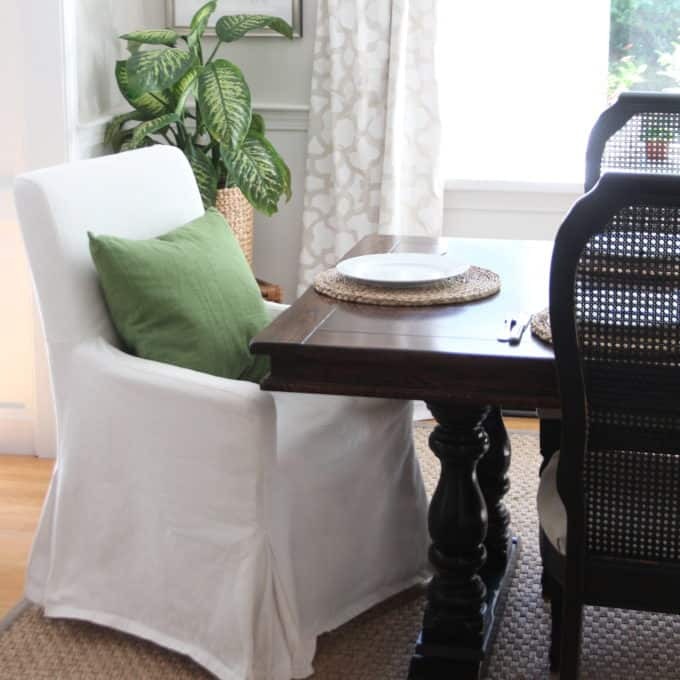 It’s perfect in your dining room, and I’m dying for the reveal with your new light! Thank you Pam!! I think I had this big idea to lighten up the table ever since you posted about your RH inspired round table that you transformed for a client. I loved how that came out!! I’m here as a result of reading your later post which you’ve already finish your table. Just curious how did you start. Glad to know your meaningful story behind your end result. I also love the quote from Mary Jean Iron. Your posts inspire me a lots, Lisa, I mean it.. Thank you so much! If you have any questions I am happy to walk you through the process!